NOTE: At some point in the future, a section providing details about some of the equipment may be added. This page is simply to give the viewer some idea of what it was like to be inside the Electric Goon. The fuselage of the EC-47, the “back end”, was the center of mission activity. The photograph below, while of mediocre quality, nonetheless shows the basic layout of the “Z” or “Q” configuration as seen from the door, looking forward towards the cockpit. (This particular aircraft carried the QRC-346 jamming system.) The navigator’s station, which can barely be seen, is the original side-mounted configuration. Note the pencil sharpener on the plotting table, and the wooden stool stowed underneath. The X console cannot be seen. Barely visible on the Y console is an MC-88 typewriter, a specially-made implement well known to all USAFSS Morse operators. All aircraft retained a few of the original C-47 bench seats to accommodate extra personnel, such as students or instructors. In this aircraft, the non-skid center aisle has worn through to bare metal in spots. The interior fuselage walls of the Electric Goon were painted a dark green zinc chromate primer, approximately FS-595 color 34151, as were the bench seats and the parachute bin. Chairs were typically black, with green or black vinyl coated fabric cushions and headrests. The navigator’s AN/ALR-34 equipment was originally sidel-mounted, as illustrated below. In the left side view, the back of the navigator’s chair, with parachute harness draped across it, can be seen at the edge of the picture. Although it served somewhat the same purpose, the device to the navigator’s right is not a WWII Norden bombsight. It’s actually a B-3 drift meter, the function of which will be explained elsewhere. 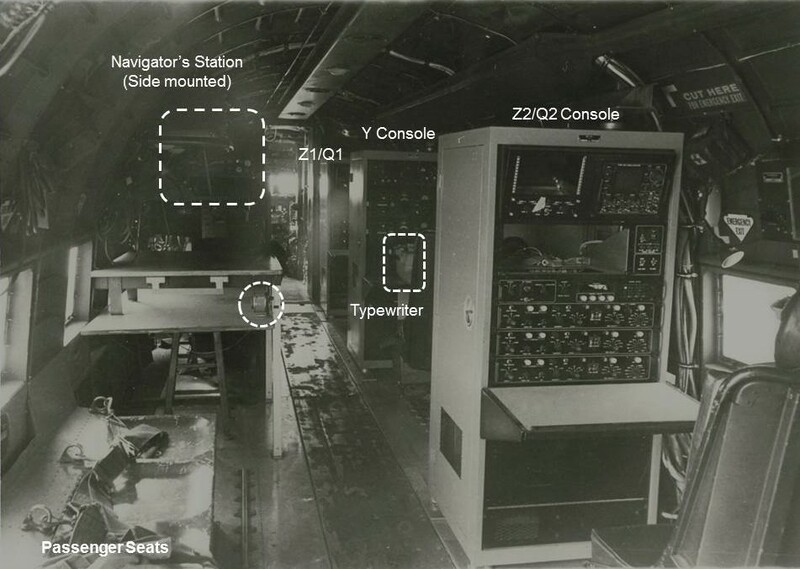 The navigator’s consoles were eventually reconfigured to the forward-facing configuration illustrated below. The left view, a bit dark, shows an AN/ALR-35 unit, which had computer-enhanced capabilities to handle some of the mathematical calcualtions. 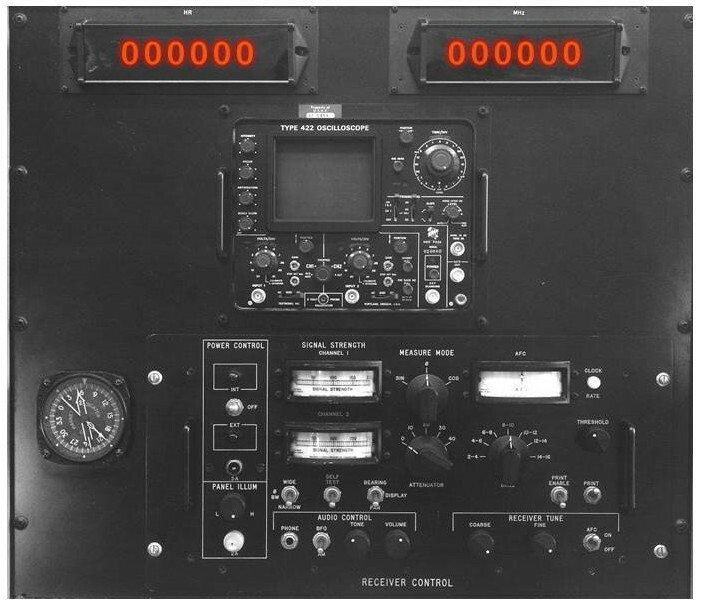 The manual ALR-34 system lacked the associated push buttons seen at the bottom of the panel. The right-hand view shows a navigator working either an ALR-35 or 38 system during an actual mission. By late 1969, or perhaps before, the "side saddle" arrays were all converted to the general configuration shown here. One of the minor unknowns, at least at this point, in the EC-47 story is exactly when and where the navigators stations were reworked. Obviously the aircraft were not ferried back and forth to the U.S. If you know the answer, by all means let us know. 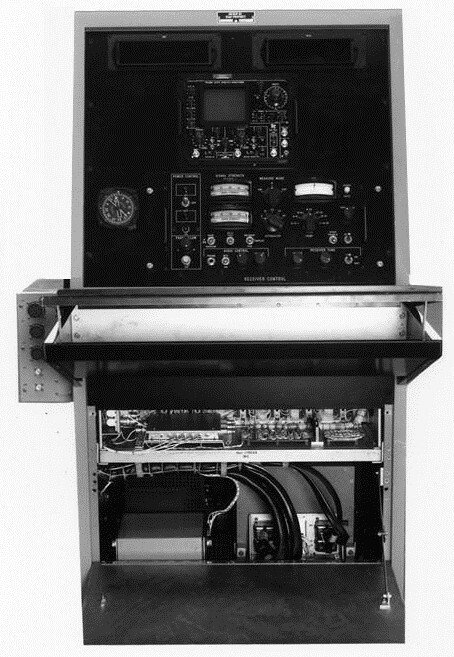 The X console contained the nerve center of the ARDF system. 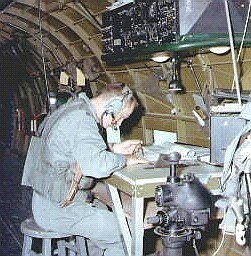 The position was manned by an experienced USAFSS Morse Intercept Operator. Archaic by twenty-first century standards, the computer-assisted AN/ALR-35 system was state of the art in its day. Unfortunately, both the photographs below are somewhat underexposed, obscuring some details. In the full-length view, the lower front panel has been removed, showing some of the complex "innards” of the console.The hinged desk top has been propped open, making for a somewhat confusing view. The space beneath could be used for stowage, sometimes including spare fuses or other paraphernalia. While not evident in the photos, the console face slanted backwards ten degrees or so. The console was obviously not powered when this picture was taken. The "Nixie tube" frequency readouts are simulated to provide a more realistic view. 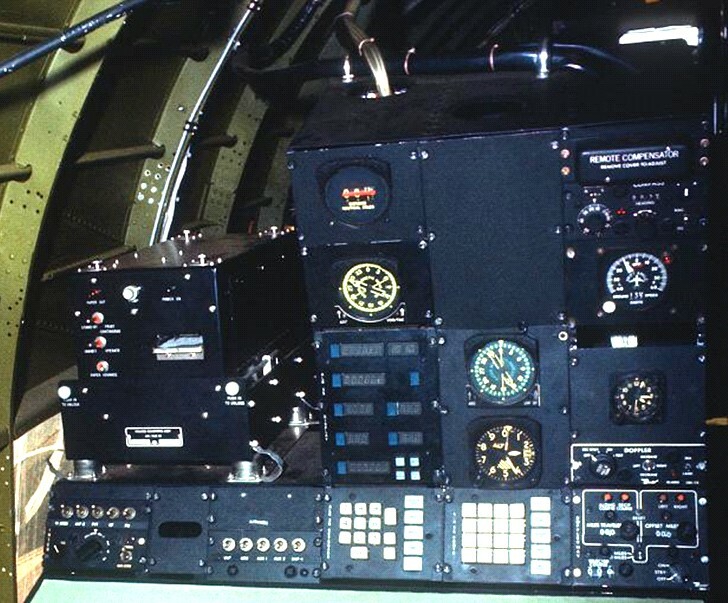 When in operation, the commercial Type 422 oscilloscope (mid-center) exhibited the typical green hues associated with such equipment. The "dial" on the left indicated the direction of the target signal relative to the aicraft heading. 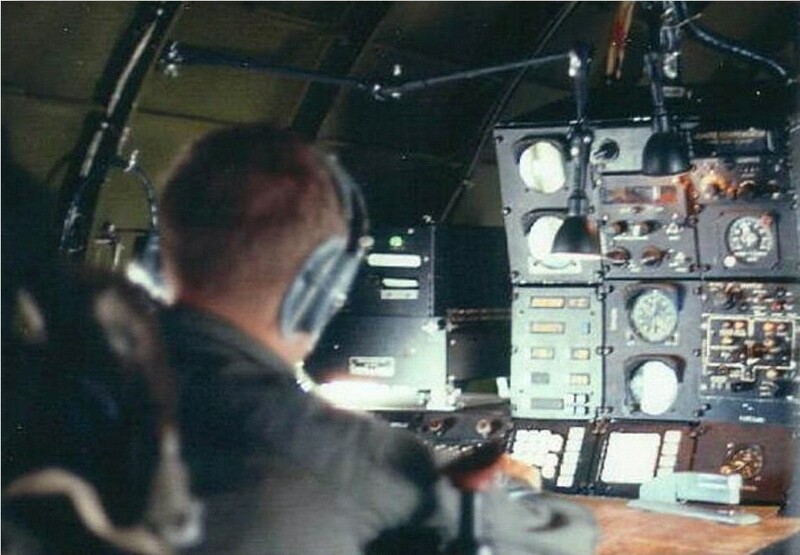 The EC-47 N and P models were equipped with X and Y consoles, although in the very first examples the Y position consisted of little more than a chair and clipboard. A later modification provided “plug and play” outlets for two collection-only positions, designated Z1 and Z2. 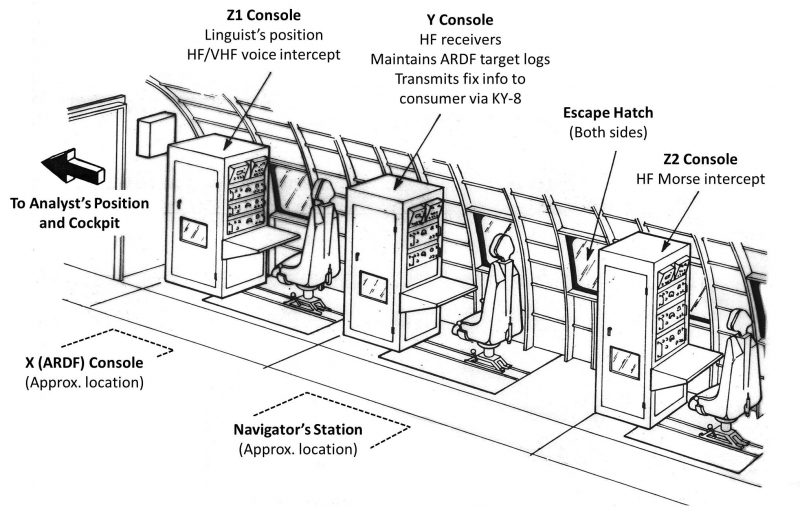 The Z consoles could be moved from aircraft to aircraft. Z1, which had VHF receiving capability, was manned by a linguist. An additional Morse operator sat the Z2 position, copying such enemy traffic as might be encountered. The QRC-346 electronic warfare suite was never used for its intended purpose. Since these “Q birds” retained ARDF and collection capability, they were employed as “Z” platforms. The diagram below shows the arrangement of the Y and Z postitions along the right side of the cabin. 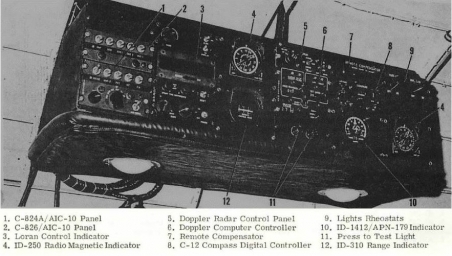 The Y and Z2 positions were equipped with MC-88 typewriters for copying Morse traffic. All three positions were equipped with tape recorders. The linguist on Z1 generally took notes by hand, with the actual intercepts being recorded for post-mission transcription/translation. Occasionally a SIGINT analyst would fly as part of the crew. As the title indicates, this person would provide real-time target identification, analysis of copied traffic, and other support functions. Unless “bumped” by an additional TEWS crewmember, the analyst usually occupied the former WWII navigator’s compartment just aft of the cockpit.